Each year in the U.S. more than 4,000 people are killed and another 20,000 are injured in fires, according to organizations such as FEMA, NFPA, and USFA. Fire Prevention is an important topic throughout the year, and while many fire safety tips apply regardless of the season, it’s a good idea to refresh your memory as we move toward the colder winter months when heating sources are used more frequently and more time is spent inside. Here’s a list of some of the most important fire prevention measures and safety tips – created with everyone in mind – you, your loved ones, your home and your business. SMOKE ALARMS. Ensure there are adequate smoke alarms installed in your home or business. 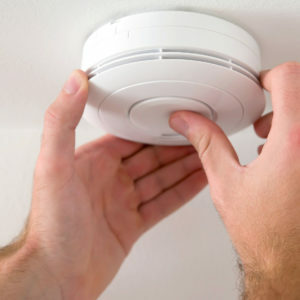 In a home, smoke alarms should be installed in all bedrooms as well as outside of any sleeping areas. In a business, smoke alarms should be placed in all common areas, waiting rooms, etc. Smoke alarms should be tested on a monthly basis to ensure they are working properly and batteries should be replaced at least once a year, but ideally twice a year. A good reminder is to change the smoke alarm batteries each time you change your clock for daylight savings. ESCAPE ROUTE. Plan ahead by implementing an escape route from your home or business. Include a designated meeting space outside and a safe distance away from the building. Make sure that children know the escape route and meeting place as well. COOKING SAFETY. Kitchen related fires are more common than you think, so make sure to always stay in the kitchen while cooking, especially if you are frying, grilling, or broiling food. Do not use kitchen equipment if you are sleepy or have consumed alcohol. ELECTRICAL FIRES. Exercise caution by not overloading outlets, power strips, or using multiple extension cords. Make sure that all plug connections are secure to prevent any sparks or overheating. HEATING SAFETY. All flammable materials must be kept at least 3 feet away from any heating sources such as a fireplace, furnace, wood stove, boiler, or portable space heater. DRYER VENTS. Regularly check to make sure both the lint filter and dryer vent are clean and free of any obstructions. It is also recommended that the dryer exhaust duct is made of metal tubing vs plastic or foil as these are more susceptible to catching fire. In the event of a fire, remember to get down low where there is less smoke and crawl your way out of the building. If your clothes catch on fire, try not to panic – stop, drop and roll. Keep rolling until the fire is out. Never go back inside a burning building. Fires can be scary, but prevention is the best way to protect you, your family and your piece of the world. For more information on fire safety, visit the National Fire Protection Association at NFPA.org.